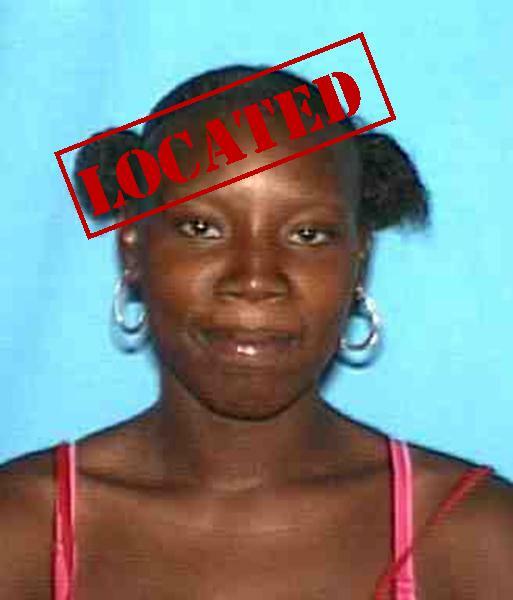 UPDATED 12/12/2012 at 1 pm: Missing person Deanna Terry was safely located in Los Angeles late this morning (Dec. 12), according to sheriff’s officials. Details on how Terry was found were not immediately available. PALMDALE – Detectives from the Los Angeles County Sheriff’s Department are seeking the public’s assistance in locating Deanna Marie Terry. Missing person, Deanna Terry, lives on East 4th Street in Palmdale and was last seen when she was released from Century Regional Detention Facility in Los Angeles at 12:54 p.m. on Wednesday, December 5, 2012. Terry has a past history of mental health issues, and was evaluated and cleared by mental health staff prior to her release. She was also given bus tokens when she was released. Terry is described as a 21-year-old Black female with black hair and brown eyes. She is approximately five feet four inches tall and weighs around 120 pounds. She was last seen wearing a red sweatshirt and blue jeans. She has an approximate one inch scar above her left eye near the eyebrow, a tattoo of “Delores” on her right upper arm, a tattoo of “Richard” on her left upper arm, a tattoo of “Dovie RIP” on her right thigh, a tattoo of “Eddie RIP” on her left thigh, and numerous stars running down the outside of both legs from her knee to her ankle. Terry’s family is very concerned and has requested media involvement to ask for the public’s assistance, sheriff’s officials said. Anyone with information about Deanna Terry is urged to contact Detective Abraham or Detective Carns at the Sheriff’s Homicide Bureau Missing Person’s Detail at 323-890-5500. To remain anonymous, call Crimestoppers at 800-222-8477. 17 comments for "UPDATED: Missing woman found"
And we need people like this living in the AV…why? At the county building on K-6? You must frequent there often. I just wondering, if she had a past history of mental issues then why did Century Regional Detention Facility release her without a family member being there. Did they just show her the door and tell her to go? Was the family not contacted about her release? This has happened before with deadly results. No reason to make jokes about the tats, could stem from mental issues. I don’t know this person but I hope she is found ok. Unfortunately, the ACLU and the like has made sure that we cannot lock people away just because on mental illness. Where is this girl’s family? She’s 21 and therefore, an adult and cannot be held unless there is strong evidence that she is a danger to herself or others. She may not get mental health assistance but you can be d@mn sure she can get an abortion on the public dime. You say that as if there’s something wrong with that. Some should not reproduce.Children deserve a sane, decent family where they can thrive. I would start checking all of the tatoo parlors in the area where she was released. Bad idea….I don’t think she has enough room for another one. Kulliid- ten to one she wasn’t found at a tattoo parlor. who gave her bus tokens and also family is [removed] up…..
Why was her family not concerned enough to meet her at the jail for her release? Especially with a past history of mental health issues?